Tag Heuer calls its Aquaracer line of watches the “essential sports watch inspired by the aquatic world.” The watches themselves, supposedly designed and developed with the help of professional divers, the Aquaracer watches pay tribute to Tag Heuer’s long involvement with scuba diving, and their watches are sported by celebrities like Leonardo DiCaprio. You too can look like Leo with the Aquaracer WAP111Z.BA0831. This sporty men’s timepiece boasts a number of features tailor made for the life aquatic. Luminescent hands and indexes provide visibility, even underwater. Its unidirectional rotating bezel is great for keeping time on dives, which anyone who has been diving knows is an essential safety feature. It is water resistant to an impressive depth of 300 meters. It even features a special diver decoration on the case back. Drawbacks: The Aquaracer WAP111Z.BA0831 is the ideal watch for divers, boaters or anyone else trying to look sharp while out on the water. It certainly delivers on all accounts therein. I also think that, unlike other sports watches, this one does not have an overly crowded face packed with little dials or gauges, which makes it a good choice to wear in more formal settings as well. I guess what I am trying to say is that there really are no obvious drawbacks to this timepiece; it is a quality watch ideal for the sporting lifestyle. So, unless you do not partake in any kinds of nautical activities, this watch is a great buy. 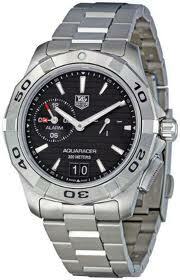 For a watch of this caliber, and one at such a reasonable price, I would highly recommend Tag Heuer’s Aquaracer WAP111Z.BA0831.